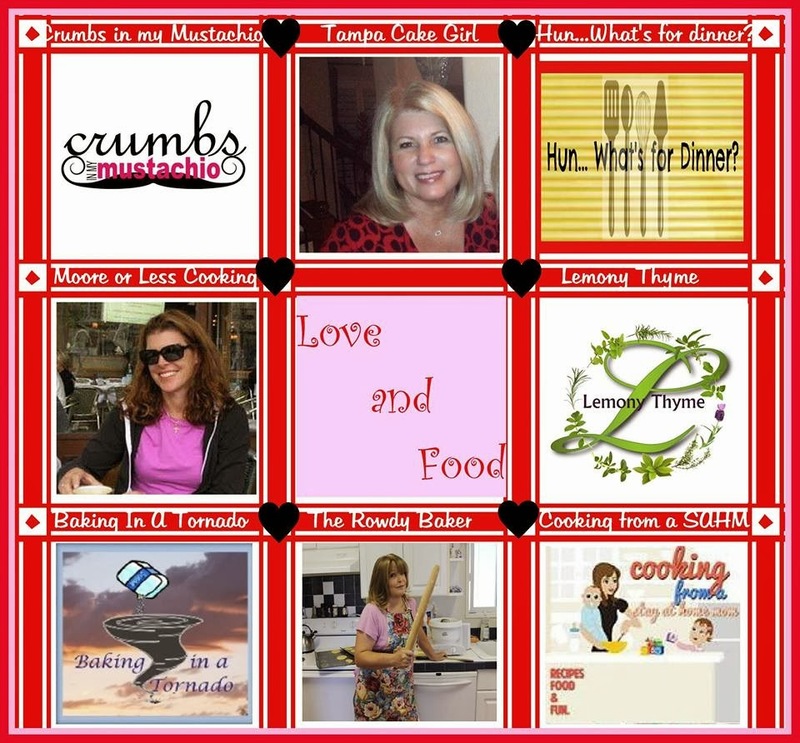 The theme for this post is : Food is Love! When I think of love, I think of chocolate. Chocolate makes everything better. 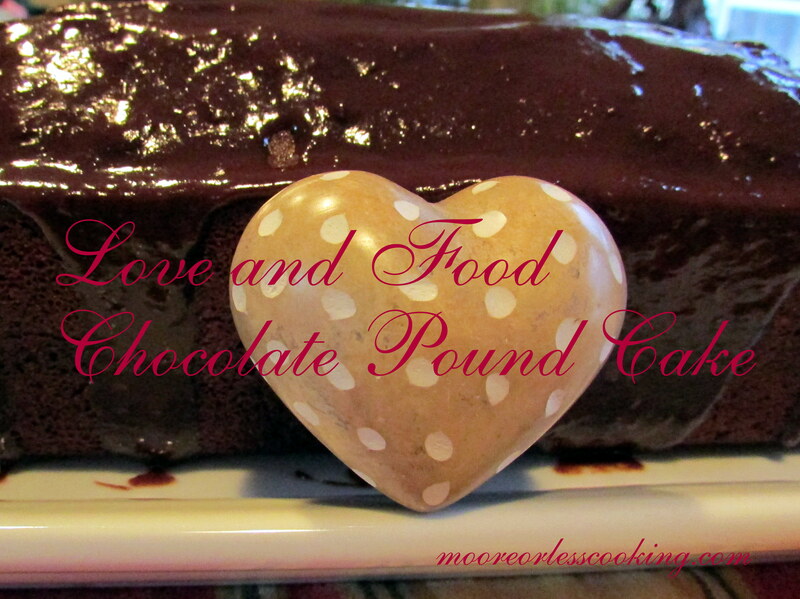 Chocolate Pound Cake really makes everything better, a chunk or just a sliver, either way I won’t walk away from that. I am part of a wonderful group of eight bloggers. We have a different theme every month. December’s theme was delicious cakes, January’s theme was yummy dips. February’s theme is love. Not just because it’s Valentine’s day this month, but because food does represent love in so many ways. Place the flour and salt in a medium bowl and whisk to combine and aerate; set aside. Place the cocoa in a medium heatproof bowl. While whisking constantly, slowly pour in the boiling water and whisk until smooth and combined; set aside. Place the measured butter and sugar in the bowl of a stand mixer fitted with a paddle attachment and beat on medium speed until lightened in color and fluffy, about 5 minutes. Stop the mixer and scrape down the sides of the bowl and the paddle. Add the vanilla and reserved cocoa mixture and beat on medium speed until combined, about 1 minute. Add the eggs 1 at a time, beating well after each addition. Stop the mixer and scrape down the sides of the bowl and the paddle. Turn the mixer to low speed, slowly add the reserved flour mixture, and mix until the flour is just incorporated. Stop the mixer, remove the bowl, and stir in any remaining flour streaks by hand, making sure to scrape the bottom of the bowl. Pour the batter into the prepared pan and spread it into an even layer. Bake until a toothpick inserted into the center comes out clean, about 50 to 60 minutes. Meanwhile, set a wire rack over a baking sheet and set it aside. Remove the cake from the oven and let it cool in the pan on the wire rack for 15 minutes. Remove the cake from the pan and let it cool completely on the wire rack before making the glaze, about 45 minutes. Place the cream and corn syrup in a small saucepan over medium heat and, stirring occasionally, bring to a simmer. Remove the pan from the heat and stir in the chocolate until smooth and combined. Pour over the cooled cake. This is what my wonderful friends are sharing this month! Limoncello Cream Dream Cake ~ Crumbs in my Mustachio. 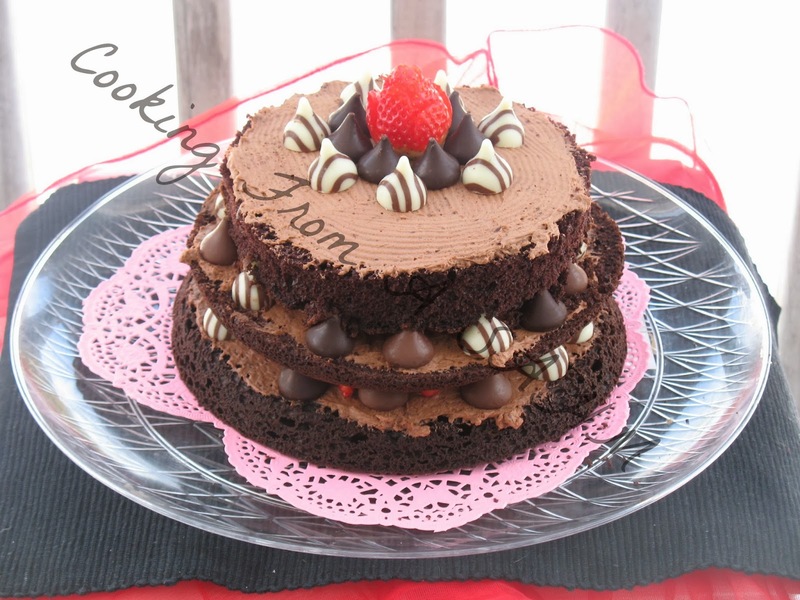 Nutella Frangelico Cheesecake ~ Tampa Cake Girl. Cherry Blossom Chocolates ~ Hun, What’s for Dinner? When I think of love I think of chocolate too. This cake looks so moist and delicious. Pound cake is one of my all time weaknesses. 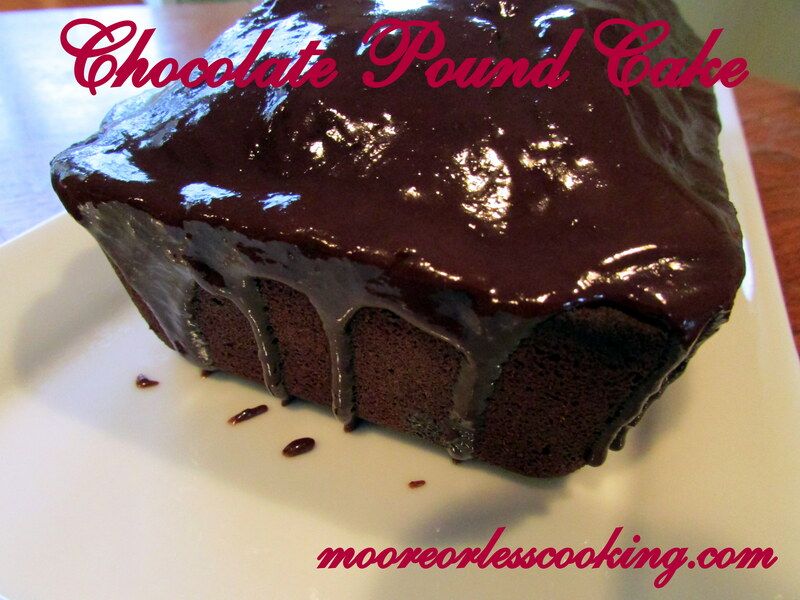 But chocolate pound cake might make me a super hero. Love this recipe Nettie. 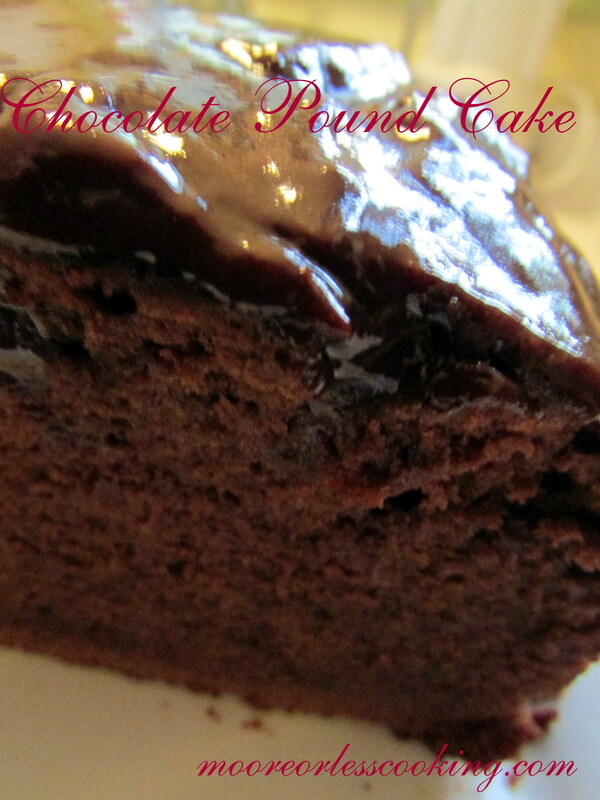 This is some serious OOEY GOOEY CHOCOLATE goodness, Nettielicious! OMG you make me want to lick the screen! !